The U.S. Consulate is partnering with the Bermuda Underwater Exploration Institute [BUEI] to offer a free summer film series from May through August, with the public invited to attend a free matinee on the last Saturday of each month featuring films that cover a range of topics. 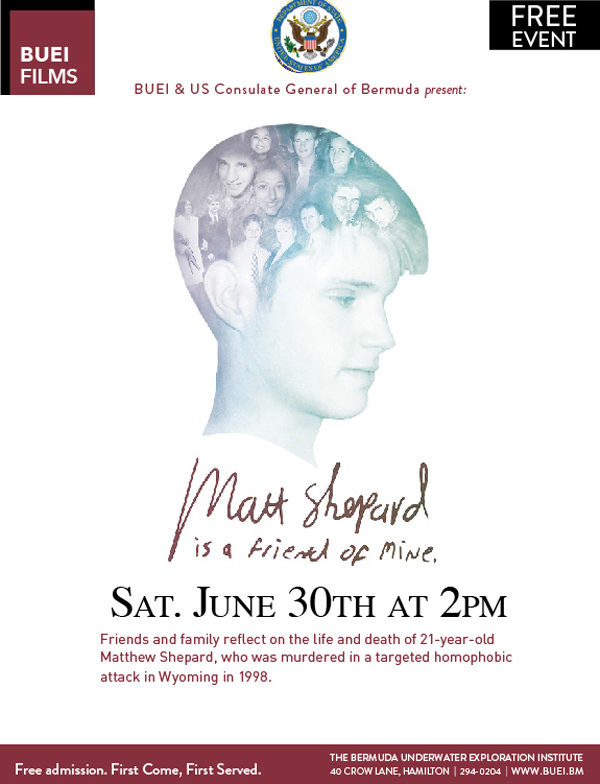 A spokesperson said, “The festival continues on June 30 with Matt Shepard is a Friend of Mine, a film that explores the life and death of a gay 21-year-old freshman attending the University of Wyoming who was kidnapped and murdered in 1998. The incident sparked a worldwide conversation about hate crimes and intolerance against the LGBTI community which is still relevant today. “Shepard’s close friend and film director, Michele Josue, takes the audience on a journey by visiting key locations in his life and interviewing friends and family members along the way. “Pride Month is celebrated in countries all over the world throughout the month of June where communities not only advocate for the human rights of all people but, promote tolerance and inclusion of the LGBTI community. “Showtime starts at 2:00 p.m. and seating is first come first served. Admission is free however, you can reserve a ticket for entry at BUEI’s Ocean’s Gift Shop, by calling 292-7219 or online at ptix.bm. “The free summer film series began on Saturday, May 26 at BUEI with a screening of Hidden Figures, the story of three brilliant African-American women working at the National Aeronautics and Space Administration [NASA] who served as the brains behind the launch into orbit of astronaut John Glenn.